Jesus, you don’t have to tell me twice. After the smash success of 2017’s “It,” excitement for the adaptation of Stephen King’s seminal 1983 novel “Pet Sematary” was bound to be huge. But since its premiere at South by Southwest weeks ago and increased attention from critics, the buzz has gone down considerably and the reception is mixed. I’m a fan of the book and many adaptations of King’s work, so even after its lackluster trailers and some bad word-of-mouth, I was really looking forward to seeing “Pet Sematary” and reaching my own conclusion. And that conclusion is, I wish I had gone to see “Shazam!” again because wow, this movie is bad. “Pet Sematary” is directed by Kevin Kölsch and Dennis Widmyer, the duo behind 2014’s wildly underseen “Starry Eyes.” The plot follows the Creed family as they move from Boston to a small town in rural Maine. What seems like an ideal fresh start for the family turns into a horrifying nightmare, when their new neighbor Jud Crandall introduces the Creeds to a pet cemetery built on their land. A series of tragedies begin to besiege the family. 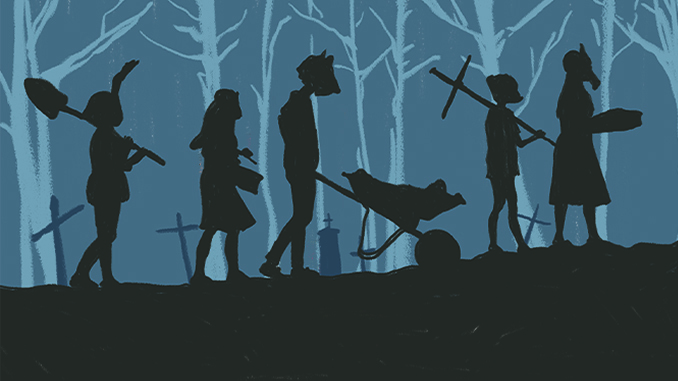 While “Pet Sematary” has a mix of supernatural thriller elements, it’s a horror story at heart — which is confusing, since it doesn’t try to scare or unnerve the audience. Instead, it just unleashes a barrage of cheap jump scares. The rest of the film is slow, boring and monotonous. This movie is 100 minutes long, and believe me, I felt every single one. It’s one thing for a film’s pacing to be slow and deliberate, allowing the audience to wallow in the terror and tension in anticipation of what’s to come. But making the viewer sit through a varying slog of expository dialogue should be considered criminal. And it would be different if “Pet Sematary” was at least visually interesting, but the only real way to describe the cinematography would be bland and uninspired. There are some clever shots where the use of shadows and fog obscures characters, which gives some scenes a slight sense of atmosphere, but that’s about as creative as this movie gets in terms of lighting and cinematography. Also, the gray color palette doesn’t help. The shot composition is competent, but there’s a certain way to block scenes in horror movies to make them scary or suspenseful. “Pet Sematary” isn’t able to do either. It feels like Kölsch and Widmyer think the only way to build tension is to show characters walking slowly through dimly lit hallways being startled with loud noises. This makes up most of the second act — characters we feel nothing for and know nothing about are put into confusing situations that don’t elicit empathy from the audience. The Creeds are a family with almost nothing special or memorable about them. We only learn about the past of the matriarch — played exceptionally by Amy Seimetz, who tries her hardest to act like this script isn’t terrible — through an enormous expositional dump toward the end of the first act. Before focusing on fun set pieces and how to scare an audience, the filmmakers need to build an interesting and engaging story. And in a time when audiences want original and innovative horror movies that challenge stereotypical genre conventions, “Pet Sematary” feels like an enormous step backward. Compared to other King adaptations, this film fares even worse against the likes of “It” and “Gerald’s Game.” “It” takes the best parts of the brilliant-but-long novel and condenses it into a fun and scary blockbuster, while “Gerald’s Game” is a disturbing and chilling piece of contained domestic horror. The biggest difference between “Pet Sematary” and these films is that — whether crafting chilling imagery or introducing new elements to established characters — they actually made the effort to elevate the source material for the visual medium. This film had the opportunity to take any of these approaches but ignored them instead. And any changes it does make have no lasting effect on the plot or characters. I don’t blame the film for trying to deviate from the source material. In fact, I wish it made more changes. Where I take issue is its handling of the new plot elements — like the exchange of certain characters’ fates or altered story beats toward the end of the film — that could have made for great additions. The novel explored grief and guilt through a family’s experience. Those themes have been examined time and time again in film. In order to distinguish itself from other movies, “Pet Sematary” had to do something special and truly unique to justify its existence. There’s one great performance and a few creepy visuals. But aside from that, “Pet Sematary” is one animal that shouldn’t have been dug up.